Sky Ski brings you the latest in technology & design, the RS Areo 41! This t-bar features the longest strut Sky Ski has ever made, it can be ridden at either 39” or 41”. And that's just the beginning of the innovation. The shape of the strut is a true "Aero" shape, and has absolutely NO drag at all. The RS Aero 41 foil comes with the Apex front wing for maximum “POP”, and the all new “Aero” rear wing. Shown with the Matrix board for the ultimate in lightweight hydrofoils. 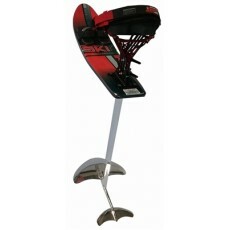 Add in the tried and true Bones Seat Tower and you have the best riding hydrofoil available today from the company that keeps bringing you the good stuff, Sky Ski!